These Digital Microscopes are an affordable way to start viewing and capturing close-up images of the circuitry on your computer chips and other items without spending a fortune on a high-end Educational Microscope! They are made to conveniently plug into your Desktop or Laptop computer via the USB port. The Intel "Play" brand of USB Digital Microscopes are no longer being made. Fortunately there are quite a few (new and used) available for sale on Amazon & eBay that remain an affordable option for hobbyists and educators. New models of affordable USB Digital microscopes are now available to consumers offering many choices and price ranges. Popular choices include Digital Blue's QX7, as well as others notable models from brands like Celestron, Plugable, AGPTek, Amscope, Neewer & Welltop. 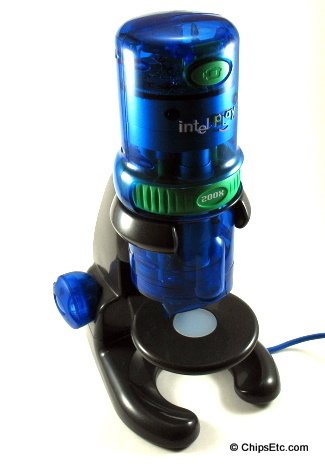 The Intel Play QX3 Computer Microscope was developed as the result of a creative partnership between computer chip giant Intel and the innovative toy designer Mattel. Having a $100 price point, this electronic video toy was Intel's attempt at entering the science education market using optics, digital imaging, and the latest computer technology at the time. The QX3 microscope connected easily to a Windows based PC via it's USB cable which also powered the microscope and its lighting. It featured 10x/60x/200x lenses and had both upper and lower adjustable lighting and focus height adjustment. The microscope could be removed from its base stand allowing it to be used as a hand-held microscope. The microscope came with software that enabled the user to snap images, make time lapse movies, import and export images, lighting control, and image effects and titling. The microscope used a CMOS CIF sensor - ideal for use in a microscope that focuses on a small image area. CIF resolution is 352x288 pixels, but the microscope software only uses a central region of interest (ROI) of the image - 320x240 pixels to be exact. The image is interpolated to 512x384 pixel resolution for display in the Microscope software's Live View window. The microscope used optical (not digital) magnification. 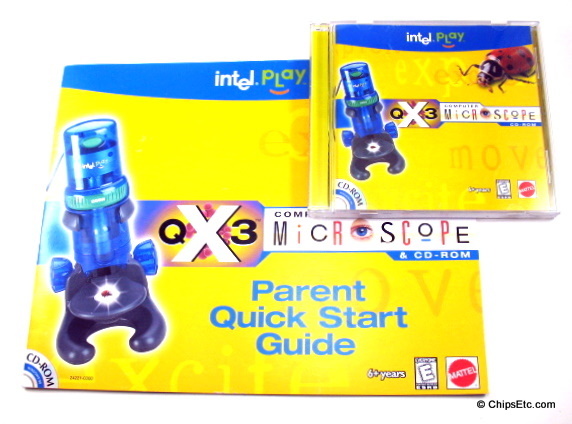 After the Intel Play line of toys were discontinued in 2002 a company called Digital Blue bought the product line and sold clones of the Intel QX3, know as the Digital Blue QX5 Microscope, which had some improvements over the earlier Intel QX3 models - upgrades included a 640x480 image capture device and brighter light source. Digital Blue's latest model was called the Digital Blue QX7. Konus makes a nice educational USB microscope. This unit has slightly better magnification than the QX3 or QX5 series ditial microscopes with magnification up to 300X. For an even better magnification option Konus also offers digital camera microscope eyepiece adapters for use with many models of higher quality optical microscopes. This computer video set enables you to view microscope or telescope images on your Windows compatible PC or laptop. It fits in the eyepiece holder of any standard microscope. Tung-Sol TSMC UNIVAC Wavesat Western Electric Westinghouse ​WYSE Etc.